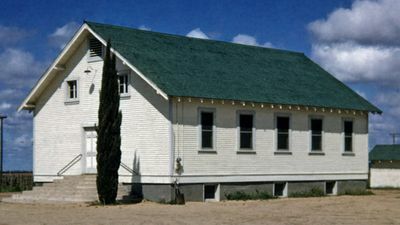 The Madera Mennonite Brethren Church, located in Madera County, California, formerly the Fairmead Mennonite Brethren Church, is a member of the Pacific District Mennonite Brethren Conference. It changed its name when the town and post office of Fairmead were discontinued. The church was organized with Cornelius Wittenberg as pastor when a number of Mennonite Brethren families from Russia settled in the district in 1911-1912. Together with General Conference Mennonites they erected a temporary church building and organized as a congregation in 1915, but the group dissolved when the settlers were unable to meet payments on the land they had purchased. On 19 October 1919, they reorganized with Peter Wall as leader and reopened the church. Bernard Wall, a brother of Peter Wall, served the church as leader for 25 years, from 1928 until his retirement in 1953. The membership rose to 36 in 1924, but later declined to about 20. On 5 November 1939 a new church building was dedicated. In 1954 the membership was 34, with Jacob R. Quiring as pastor. The congregation later changed its name to Madera Avenue Bible Church. Center for Mennonite Brethren Studies, Fresno, CA: Record Group CB518. Neufeld, I. G. "Madera Avenue Bible Church (Madera, California, USA)." Global Anabaptist Mennonite Encyclopedia Online. March 2014. Web. 20 Apr 2019. http://gameo.org/index.php?title=Madera_Avenue_Bible_Church_(Madera,_California,_USA)&oldid=138886. Neufeld, I. G. (March 2014). Madera Avenue Bible Church (Madera, California, USA). Global Anabaptist Mennonite Encyclopedia Online. Retrieved 20 April 2019, from http://gameo.org/index.php?title=Madera_Avenue_Bible_Church_(Madera,_California,_USA)&oldid=138886. Adapted by permission of Herald Press, Harrisonburg, Virginia, from Mennonite Encyclopedia, Vol. 3, p. 435. All rights reserved. This page was last modified on 6 October 2016, at 07:00.